Snowbound in the Yukon: Feeling so good today! Today was weigh-in day!! I officially have lost 40lbs. I'm so happy. 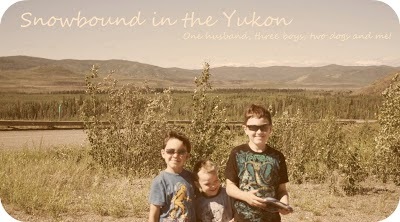 We had an adventure day with the boys, we planned on going to a lake we hadn't been to with the boys. Neither Hubby or I have been there for years and thought we'd go. The road was sketchy with mud and ruts and we got to the lake but it was completely surrounded by march like bog and no place for a picnic/weiner roast too wet! So we decided to go the Moose Creek but on the way there we passed a emergency airstrip that is right next to the river and we went there instead and had a weiner roast and the boys played and explored. We all had a great day! My computer's been messed up so I'm just seeing this.